*Portable and Practical -Tiny, ultra-thin and cool design. Can be easily carried in pocket or bag and shoot anywhere. Easily mount on your phone with the magnet metal plate. *300 times brighter than LED flash -This external Xenon flash light is specially designed for iPhone 5/5S/6/6 Plus/6S/6S Plus, 300 times brighter than LED flash, 6m (ISO400,f/2.4) flash range, No red eye, true to life illumination. *Noise free night shooting -Suitable for low-light situations, the best accessory for selfies, with this Xenon flash, you can launch self-timer at dark environment, the photo you take at dark will be as nice as you can imagine! 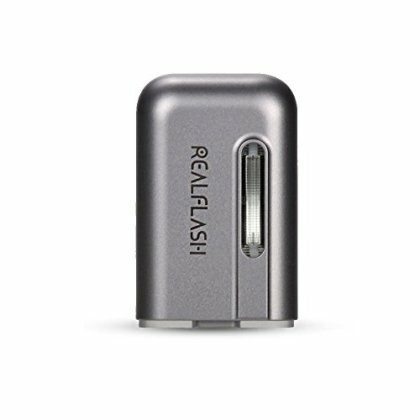 *Built-in rechargeable lithium battery - 20 minus Micro USB charging, up to 152 times flashes on a single full-charge.